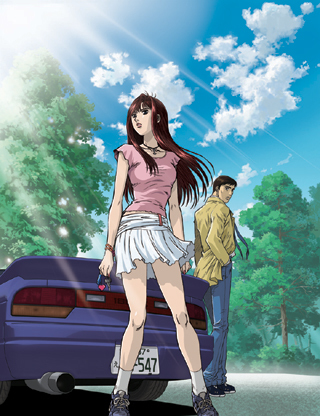 It's been quite awhile since there are any news for Initial D anime. Recently, AVEX has confirmed a new installment for the Initial D anime series that marks the 10th anniversary for the franchise. The new side story is called Initial D Extra Stage 2: Tabidachi no Green. It is set to air on SkyPerfectTV in October and the DVD set will come out on December 5th. Pre-order of the set is not available yet. A BOX set will also be released on the same day. The Extra Stage BOX set contains the first Initial D Extra Stage and the new Extra Stage 2. For more information, please refer to the Official Site. There is a short clip on the Official Site showing some of the new content from Initial D Extra Stage 2. Unlike the first Extra Stage, this one is actually based on a manga side story that was released by Shigeno back in 2001. It takes place canonically while Project D is facing off against the Todou Juku. Iketani has a chance encounter with Mako and they agree to another "meeting", which Iketani arrives early to this time. He runs into a lost old guy, and gives him a ride, but suffers a blown tire on Usui before he can get back. It's very exciting the series still going at it. Surely, this will spark more traffic here at IDW. I'm so glad their still working on it. Oh oops. Looks like somebody spilled the beans a tad early. Like...way early? Rename the file to .flv. Idiot uploaders are idiots. That trailer was captured from the Official Site I linked in the first post. Nothing new here, moving on. Ah well, I'll lurk around Share on the 3rd and see if it turns up. I pray this better end well. I feel bad for the lonely drivers. Been a while.. No subbed version yet? I'm growing concern.. I don't want to spoil it all by watching the raw but it's been a MONTH. Lack of interest is probably the reason you're not seeing subs. A lot of us have seen the raw already, and there honestly isn't much to get out of it. I watched it twice and deleted it. Not to mention the raw was ugly and the wrong aspect ratio. Ugh. Maybe when the DVD comes out there'll be more interest. i'll wait for their subbing of it, i've waited long time, but i'm sure you all waited for a even longer time,lol. Who is this "they" you're speaking of? I don't recall anybody in any fansub group saying they were waiting to work on this. Oh man, you were so close. "They? Who's this 'they' you're referring to?" Sorry, but I wasn't cleverly putting a quote in there. Just another ho-hum normal inquiry here. WOO go go gadget TV conversions! LOL. I mean that the 'DVD' you got was probably bootlegged from the TV broadcast. Probably not the best subs, either. Bootleggers tend to make the funniest mistakes with their "expert" translations.